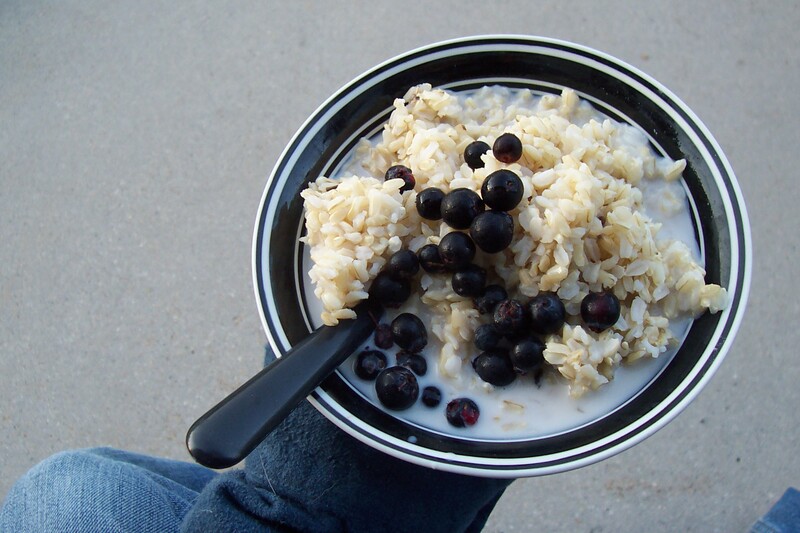 The above is a photo of brown rice, Serviceberries and almond milk. I sat on the front porch in the sunshine, watching the birds and ate this delicious and inexpensive breakfast! There is another way that a plant-based diet saves money. Eating a plant-based diet is much less expensive to begin with! So, along with the post last week, a veg diet is like a one, two punch. Not only is it better for your health, which saves money on sick time, insurance premiums, and complications later on, the diet itself is much less expensive. Rice, potatoes, herbs, sweet potatoes, spices, legumes, whole grains, fresh veggies and fruit. These are the basics that constitute a vegetarian, or plant-based diet. They are inexpensive and go further with less. They add up to virtual pennies in the scheme of shopping for food. It is fantastic! Pound for pound rice, potatoes and legumes go further than butter, eggs, cheese, milk and meat in terms of nutrient density. Likewise, pound for pound the plant foods do more with less than the animal foods in the monetary sense also. The plant foods cost less than the junk food, and unlike the latter, plant foods are not taxing on your body, but are actually just what your body needs! It pays in more ways than one to eat plant-based! Be sure to view my 7 step guide.